For a long time, food delivery was relegated to specific genres like pizza and sandwiches, but the advent of apps like GrubHub and Seamless has made pretty much any kind of food delivery possible assuming you live in a reasonably large city. Still, certain restaurants still require you to put on pants and leave the house in order to procure their food, adding an ever-so-slight barrier between you and those good eats. One such restaurant is McDonald’s, but it sounds like the dream of having a delicious, meat-style McRib sandwich brought directly to your door may soon become a reality. 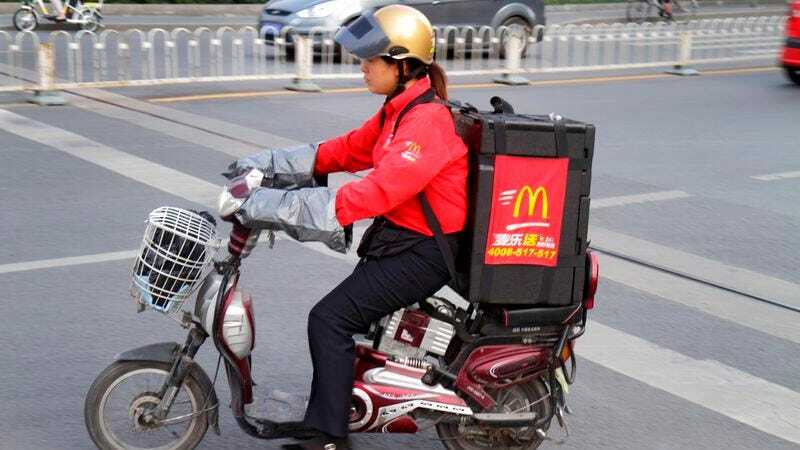 According to Buzzfeed, McDonald’s recently announced that it is “experimenting with different delivery methods,” including teaming up with third-party delivery services around the world. McDonald’s notes that it is uniquely positioned to transition into delivery, because “75 percent of the population” in the U.S., France, the U.K., Germany, and Canada live within three miles of a McDonald’s. That means very few customers would be outside of any restaurant’s delivery window, so even people who can’t use stuff like GrubHub or Seamless because of where they live will still be able to get McDonald’s delivered. The Buzzfeed story also notes that some countries already offer McDonald’s delivery, specifically China, South Korea, and Singapore, and it has apparently been very successful for them. Considering how much Americans love fast food and how exceedingly lazy we are, it stands to reason that this could be an even bigger phenomenon over here—at least until we all die from ordering too much McDonald’s.